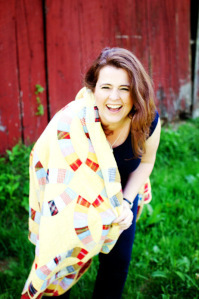 I wrote my first story when I was a nine year- old, freckled-faced tomboy in the foothills of the Blue Ridge Mountains. Coming from a long line of oral storytellers, weaving a good yarn seemed a typical part of my life. It wasn’t until I finished college, had two children, and a full time job before I began to study the ‘craft’ of writing (you know when I had plenty of time). So…now I’m a 38-year old, freckled-faced mommy enjoying life, learning to write, and laughing often. My mom says that I must have a small bit of insanity because I don’t realize how stressed I ought to be. Wow! Is The Thorn Bearer really Pepper Basham’s debut novel? This book has it all — complex plot, well-devoloped characters and a strong faith message. Oh yeah, there is romance for those of you who like a good love story. All in all this book is one I can highly recommend! Ashley Dougall keeps a heart-shattering secret, but that isn’t unusual for the Dougalls who all seem to harbor one deceit or another. Left at the altar and feeling like damaged goods, Ashley makes her way from her beloved North Carolina back to her family home in England. The threats of war and their accompanying dangers seem a world away until she boards the Lusitania. The Thorn Bearer is a great read. Basham has really done her research. I had little knowledge of the sinking of the Lusitania and the Zeppelin raids on England during WWI. Her attention to detail brings the era to life including the changing roles of women in the early 1900s. Her characters act and react realistically in the context of the times in which they lived. But it is the faith message that really captured my heart. Ashley is the victim of childhood sexual abuse and carries the burden of another’s sin. Her life revolves around helping others in an attempt to prove herself worthy to a God she believes in, but has trouble completely trusting. As her secret becomes known, other characters react in ways that either build Ashley’s faith or rock it to its core. But in the end, she knows that God can bring healing and forgiveness no matter what we’ve done or what has been done to us. Characters are strong in The Thorn Bearer. Their strengths, weaknesses, sins and virtues make them feel like real people. And they continue to grow throughout the novel, bringing hope to a story that reveals the redeeming love of Christ. There was one minor character that I particularly liked. Fanny is Ashley’s long time maid. Her steady love and faith, bolster Ashley even in times of deep despair. And her illustration of soiled napkins at a dinner party, one completely filthy, the other slightly stained, but neither acceptable, underlines that our righteousness only comes through Christ’s sacrifice. 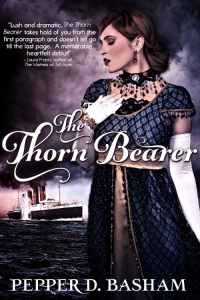 A beautifully crafted story of love, redemption and forgiveness, The Thorn Bearer is perfect for fans of historical romance. Yet it is so much more. If you liked Francine Rivers’ Redeeming Love or Susan May Warren’s Daughters of Fortune series, then you really need to check out The Thorn Bearer by Pepper Basham. Reblogged this on Pepper D Basham. Loved this book! I appreciated the chance to read it and review it. Looking forward to the next one. Me too Gail! Thanks for stopping by!